You have seen them around. Not many but they are multiplying. QR codes have arrived and are changing our world! The greatest invention since the smart phone, QR codes bridge the gap between the physical world about us and the world wide web. Scan a QR code and you will have instant access to information either in the QR code itself or on the web. Share it with your friends. The use of QR codes increases the scope and reach of advertising and enhances the content of shows, exhibitions and guided tours. It makes it easier to share contact details and provides fun additions to greeting cards, badges, wrist bands and t-shirts. 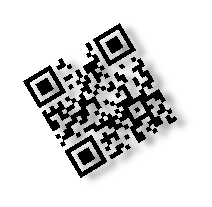 This web site has been built to help you manage your use of QR codes in your environment. It is critical that your QR codes point to the correct information and that the information is available and accurate 24 x 7 for the duration of your campaign. We provide the tools for you to generate QR codes automatically. We provide storage on the web for your media items. We provide statistics on how often your QR codes are being scanned. Explore our pages of Examples and Packages to see how QR codes can benefit your business or event. Contact us now if you cannot find what you want. We can help develop a QR code solution for you. As new uses for QR codes surface we will be there to help implement them. Toyota, Coca Cola, the BBC, Sky, M&S, Tesco and the Tate Gallery have started using them. You can too. Our creative staff have several ideas on how to enhance your multimedia artwork. A QR code is a 2d bar code that can range from stamp size to metres high on a billboard. It contains information that can be picked up by scanning it with a mobile phone. The information can provide readable details or a reference to information held on the web accessed via the mobile data network. In its simplest form it can be used to communicate a greeting, contact details or a reference to a web page. However with the arrival of smart phones, with their access to phone, text, email, GPS, and WiFi services, they can provide a fast wireless connection to web sites, location based web services and social web sites. For the smart phone user access to the QR code is quick, easy, accurate, paper free and fun. The information is available 24 hours a day seven days a week and can be stored on the phone for future reference. Information can be shared via text, email and social networking web sites. The technology can provide information based on where you are and help navigate you to places of interest. The business benefit is that organisers and sponsors gain access to a young dynamic community. Access can be engaging and fun. Advertising can be targeted and relevant. Users can be directed to sponsor web pages giving latest news and offers. Target pages can be modified centrally without the need to issue new QR codes. Users can register to subscribe to newsletters. Through text, email and social networking the reach of advertising is extended to the target market. Via the same services feedback can be obtained. Statistics can be provided to show metrics of usage. Key in text then scan the code. Try our QR Code Generator here. You can generate standalone QR code for free! Bookmark this site. In 2012 we will be introducing our range of QR code management products. Please explore our site and see what’s coming soon.